Until recently, the history of thatch had never been professionally studied, which led to a proliferation of theories about the origin and legitimacy of the different forms. Research and archaeological investigations starting in the 1990s have expanded our understanding of the history of ancient thatch and of post medieval thatching materials and methods . Click on the headings below for a summary of the history of thatch in England. Although there is virtually no archaeological evidence for the pre-historic use of thatch, it is likely that plants or vegetable matter such as turf were used for the earliest roofs. Documentary evidence for thatching dates back to at least c.700 AD. Throughout the Norman and early medieval periods there are references to thatched towns destroyed by fire. Building accounts dating from the 13th century reflect the use of thatch for roofing buildings of considerable status, including churches, castles, colleges and grand houses. The low cost and widespread availability of materials suitable for thatching ensured its widespread use on buildings of lower status too, in both town and country. The oldest surviving thatch in England dates from the early 14th century. This is found on former open-hall buildings, where original base-coats of ancient thatch are preserved beneath later coats. This thatch is blackened by the smoke that rose from open fires in the early medieval period, before chimneys had been developed. Although only a small number of these roofs have been documented, many more (possible a few hundred) are thought to survive. These roofs provide invaluable insights into the agriculture and building technology of their time, as well as providing examples of earlier ‘land races’ of cereals (not produced by selective breeding). This surviving evidence (derived mainly from buildings in the south west) indicates that straw thatching was the norm in these counties. During the medieval period the popularity of thatch in urban areas gradually declined due to the risk of fire spreading rapidly from one thatched building to another. The use of thatch was banned in London in 1212, and over the next few centuries, many urban centres followed suit. In rural areas however, it remained widespread for many centuries, as it was cheap and readily available. For more information read: Letts, John (2000). Smoke Blackened Thatch: a unique source of late medieval plant remains from Southern England. Reading & London: University of Reading and English Heritage. During the Industrial Revolution, canals and railways brought other roof coverings, particularly Welsh slate, within reach of most sectors of the population. It is estimated that in 1800 there were nearly one million thatched buildings in England, but from about 1860 there was a steady decline until the latter part of the 20th century. For more information read: J Moir and JB Letts. Thatching in England 1790-1940. English Heritage Research Transactions 5, London, 1999. The two World Wars accounted for the loss of skilled men, with devastating effect on the traditional rural social structure. In relation to thatch, the number and quality of thatched buildings further declined. 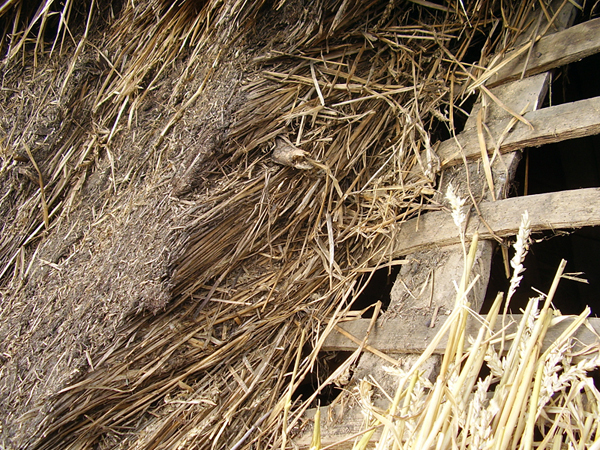 Increased mechanisation, including the combine harvester stimulated the production of short-stemmed wheat varieties, totally unsuited for thatching. Thatchers were forced and encouraged to use water reed as an alternative. Historically, a lot of thatching was carried out by non-specialists. These were farm workers, who undertook repairs to thatched buildings alongside their agricultural activities. Unlike many other building crafts, thatchers did not associate themselves in guilds or trade federations. Only in the 20th century did thatchers form collectively. In 1947 county-based Master Thatcher Associations (MTAs) were formed to improve and encourage high standards. The 12 regional MTA’s came together in 1967 to create the National Society of Master Thatchers’ Associations (NS-MTA) in order to present a national voice for the industry. In 1977 a small group of thatchers formed the National Society of Master Thatchers to accommodate individual membership and members who were unconnected to the county associations. The former National Society renamed itself the National Council of Master Thatcher Associations (NC-MTA) in 1987. The National Society of Master Thatchers Ltd. (NSMT) is a limited company and has approximately 100 individual members, or 10% of the industry. Most of the regional MTAs are thriving, but the National Council currently works on a limited basis. Both the National Society and the MTAs comprise individual thatchers. Members join through peer assessment and endorsement. At the present time, the thatching industry in the UK does not have a ‘national’ democratic voice. By the 1970s the number of thatched buildings stabilised, partly as a result of the protection afforded by listing, which meant that thatched roofs of listed buildings were unlikely to be changed to another material. Planning controls and private investment in thatched properties has helped secure this important craft. For more information read: J Cox and JB Letts, Thatch. Thatching in England 1940-1994. English Heritage Research Transactions: Research and Case Studies in Architectural Conservation, 6, London, 2000. There are estimated to be around 1,000 thatchers working in England today. Most of these are sole traders or companies of under 5 employees. 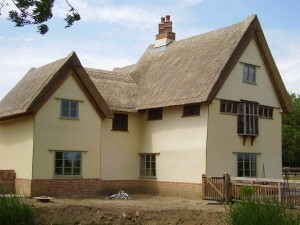 The majority of thatching work in England is carried out to older buildings, most of which are listed. From the late 20th century, there has been an increase in the number of new thatched houses being built, but the numbers are lower in the UK than in some other European countries such as Germany, Holland and Denmark.